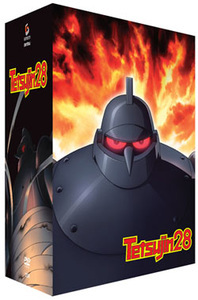 This edition of Tetsujin 28 1 includes episodes 1-5 and an artbox to hold all the remaining DVDs in the series! The journey begins when Professor Kaneda creates the ultimate soldier robot, Tetsujin, as a substitute for his son, Shotaro, whom he mistakenly died in a bomb raid on Tokyo during World War II. To prevent the army from using Testujin as a tool for destruction, the professor hides the robot on a remote island. Ten years after the war, Tetsujin is finally resurrected after 28 attempts made by the late Professor Kaneda's protege, Professor Shikishima. Meanwhile, Shotaro has grown up to become a genius boy detective and now joins forces with his beloved Tetsujin to wage a courageous battle against evil! A legendary masterpiece, which shines in the history of postwar manga, is now resurrected brilliantly!